The past 37 running of the Japan Cup (G1, 2,400m) were won by 23 Japanese runners and 14 foreign contenders – the last of the foreign winners being Alkaased (USA, by Kingmambo) in 2005 and the following 12 up to last year won by our own local runners. This year, two foreign contingents are slated to run for the title and put a stop to Japan’s winning streak. Capri (IRE, C4, by Galileo) trained by Irish trainer and one of Europe’s leading horsemen, Aidan O’Brien, was the winner of two three-year-old classic titles last year, the Irish Derby (G1, 2,400m) and the St. Leger (G1, 2,900m), and while the Alleged Stakes (G3, 2,000m) is his only group-race victory this season, he has remained a major factor in big events such as the Prix de l’Arc de Triomphe (G1, 2,400m) and the Champion Stakes (G1, 1,990m) in which he finished fifth and fourth, respectively. Another European contender, British-trained Thundering Blue (USA, G5, by Exchange Rate) has yet to win a group-one title but his rating of 119I assigned to his third-place performance in the International Stakes (G1, 2,050m) stands above Capri’s 118L as of his fifth place in the Arc. 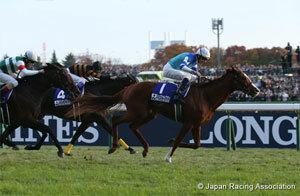 While facing middle-long distance turf runners in Japan that are of high standard with the additional advantage of racing at home will be a tough task to take, there is much anticipation for the two outstanding runners from abroad to demonstrate their true form and be among the top finishers. This year’s Japan Cup will miss Tenno Sho (Autumn) (G1, 2,000m) victor and last year’s Japan Cup runner-up Rey de Oro (JPN, C4, by King Kamehameha) but the 2018 field has gathered several top G1 calibers from all generations including the season’s three-year-old triple crown filly Almond Eye (JPN, F3, by Lord Kanaloa). Much attention is focused on whether the filly, who became the fifth filly in JRA history to accomplish the triple and coming off a five-race winning streak since breaking her maiden in her second career start, is able to pull off another feat in following Gentildonna (JPN, by Deep Impact) in 2012 as the second three-year-old filly to claim the Japan Cup title. Almond Eye has proved herself at another level from her fellow three-year-olds in her three G1 starts run at various course and distances; the Oka Sho (Japanese 1000 Guineas, G1, 1,600m) at Hanshin Racecourse, the Yushun Himba (Japanese Oaks, G1, 2,400m) at Tokyo, and the Shuka Sho (G1, 2,000m) at Kyoto. Her arsenal is no doubt the finishing speed which has marked the fastest (last three furlongs) in all six of her career starts and the long and wide homestretch at Tokyo gives her every chance to demonstrate her power. Her sire Lord Kanaloa (JPN, by King Kamehameha) was a multiple G1 sprint winner including back-to-back victories in the Hong Kong Sprint (G1, 1,200m), but the speedy filly has already proved well equipped to handle 2,400 meters when winning the Yushun Himba for which she was rated 115, the highest and tying with Gentildonna (2012). Almond Eye also has the advantage of carrying 53kg in her Japan Cup bid against a mixed field of top senior G1 caliber. Only four three-year-olds, colts and fillies combined, have succeeded in winning the Japan Cup in the past but the Lord Kanaloa filly has a good chance to become the fifth three-year-old Japan Cup winner in partnership with Christophe Lemaire who is the current leading JRA jockey. Her best rating as of this season is 115M,I,L as of her victories in the Oka Sho, the Yushun Himba and the Shuka Sho. Suave Richard (JPN, C4, by Heart’s Cry) is the second highest rated four-year-old behind Rey de Oro in the JPN Thoroughbred Rankings with three out of five career wins won at 2,000 meters including his first G1 victory this year in the Osaka Hai (G1, 2,000m). He can also handle extra distances as demonstrated in his runner-up effort to Rey de Oro in the Tokyo Yushun (Japanese Derby, G1, 2,400m) and his victory against his seniors as a three-year-old in the 2017 Copa Republica Argentina (G2, 2,500m) in which he carried 56kg (equivalent to 58kg for older horses) but won by 2-1/2 lengths. Despite proving well suited to Tokyo Racecourse, he was defeated in his two recent starts, the Tenno Sho (Autumn) and the Yasuda Kinen (G1, 1,600m), but these can be excused due to a disadvantage in the former where he was pinched back right after the start and the mile distance in the latter that was way too short for the Heart’s Cry (JPN, by Sunday Silence) colt. In a smoothly run race where he can make use of his lasting speed, Suave Richard has the ability to be a serious threat under Mirco Demuro, currently second in JRA’s jockey standings. Suave Richard is rated 121I as of his victory in the Osaka Hai. Kiseki (JPN, C4, by Rulership) struggled after his victory in the Kikuka Sho (Japanese St. Leger, G1, 3,000m) last year but regained his form this fall with a third-place finish in the Mainichi Okan (G2, 1,800m), two starts back, and validated the run with a class performance as a classics winner with another third in the Tenno Sho (Autumn) last month in which he dictated the pace and held on gamely to finish 0.2 seconds behind winner Rey de Oro while holding off 2017 Satsuki Sho (Japanese 2000 Guineas, G1, 2,000m) victor Al Ain (JPN, C4, by Deep Impact). His versatility has broadened his chances in different situations within the race so his positioning can vary depending on the pace and how the race unfolds. Another favorable factor for the Rulership (JPN, C4, by King Kamehameha) colt is that five out of 10 recent Japan Cup winners have come off the Tenno Sho (Autumn). 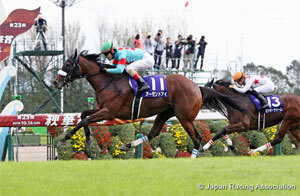 His rating 119I is as of his third-place finish in the Tenno Sho (Autumn). While past data shows that those coming off the Tenno Sho (Autumn) have had the edge in claiming the Japan Cup title, two standouts from the five and six-year-old group come off the Kyoto Daishoten (G2, 2,400m) for the coming G1 race, and for the reference, the last two Japan Cup winners came off the same race held at Kyoto. Satono Diamond (JPN, H5, by Deep Impact) won the last leg of the three-year-old Triple, the Kikuka Sho, in 2016 then proceeded to claim the year-end Arima Kinen (G1, 2,500m), beating a tough field of senior G1 talents that included subsequent Horse of the Year Kitasan Black (JPN, by Black Tide). But while the son of Deep Impact (JPN, by Sunday Silence) is counted among one of the top runners in the Japan Cup field, the five-year-old has just come out of a prolonged slump since being heavily defeated in the 2017 Prix de l’Arc de Triomphe followed by a winless spring campaign that consisted of sub-par performances in three starts and hopes to build up on his first win in 19 months last start in the Kyoto Daishoten. Satono Diamond has a record of three wins; the Arima Kinen, the Kobe Shimbun Hai (G2) and the Kyoto Daishoten, and a second in the Tokyo Yushun which he just missed by a nose, out of four starts in Japan at distances between 2,400 and 2,500 meters. His latest win in the Kyoto Daishoten did not exactly show a complete return to his best, but there is much anticipation towards his second start of the fall over 2,400 meters at which he excels. Joao Moreira, who has been racking up wins and staggering winning rates in JRA races, is expected to take the reins. 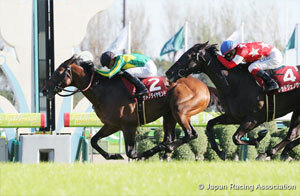 Satono Diamond is rated 117L for his victory in the Kyoto Daishoten. Japan Cup defending champion Cheval Grand (JPN, H6, by Heart’s Cry) has been considerably consistent throughout his career, especially at distances at 2,400 meters and beyond, in which he uses his stamina and lasting speed, and has finished worse than fourth in just two starts out of 16. Following his successful fall campaign last year, the son of Heart’s Cry comes off the same racing plan of improving on his first up run coming off a summer break in the Kyoto Daishoten. The six-year-old has turned in good results in all three career starts at Tokyo Racecourse where he has two wins; the 2017 Japan Cup and the 2016 Copa Republica Argentina, and a third in the 2016 Japan Cup, so his chance to become the second consecutive Japan Cup winner may not be all that slim. His half-sister Vivlos (JPN, M5, by Deep Impact) is also a G1 winner of the 2017 Dubai Turf (G1, 1,800m) – she finished second in the same race this year. 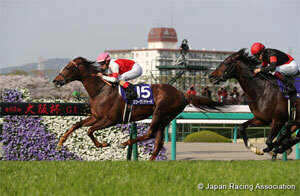 Cheval Grand is rated 117E for his runner-up effort in the Tenno Sho (Spring) (G1, 3,200m). Other notable runners in the field include Takarazuka Kinen (G1, 2,200m) victor Mikki Rocket (JPN, H5, by King Kamehameha) who claimed his much-awaited G1 victory in his seventh G1 attempt by saving ground before making an early move to assume command into the stretch and held of a powerful chase by Hong Kong’s Werther (NZ, G7, by Tavistock) and other late chargers for the win. Dismissed to eighth choice in the Tenno Sho (Autumn) despite his Takarazuka effort, the son of King Kamehameha (JPN, by Kingmambo) demonstrated his continued good form with good speed from the inside to come in a close fifth, 0.4 seconds behind winner Rey de Oro. 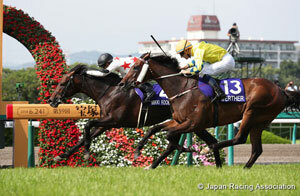 While the five-year-old is lacking in a quick turn of speed, Mikki Rocket possesses long-lasting speed that can carry over extended distances so the extra 400 meters in the Japan Cup should be an advantage and, if the race development unfolds into a situation where he can make another early move to the front, he has the ability to rally for the top position to the wire. 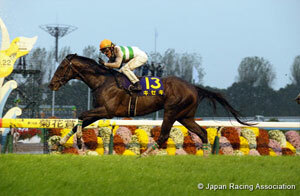 He is rated 120L for his victory in the Takarazuka Kinen.